"Today the theory of evolution is about as much open to doubt as the theory that the earth goes round the sun..." Richard Dawkins, The Selfish Gene, p. 1. 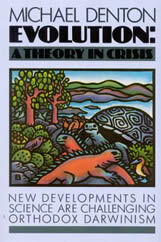 "The lack of any scientifically acceptable competitor leaves evolutionary biology in a state of crisis analogous to the crisis in medieval astronomy when, although the Ptolemaic system was admitted to be a monstrosity, the lack of any conceivable alternative imprisoned the science for centuries within the same circle of belief (p. 357)...that [Darwinian theory] is neither fully plausible, nor comprehensive, is deeply troubling. One might have expected that a theory of such cardinal importance, a theory that literally changed the world, would have been something more than metaphysics, something more than a myth." p. 358. "For Darwin, all evolution was merely an extension of microevolutionary processes. Yet, despite the success of his special theory, despite the reality of microevolution, not all biologists have shared Darwin's confidence and accepted that the major divisions in nature could have been crossed by the same simple sorts of processes." p. 86. "...the possibility of life arising suddenly on earth by chance - is infinitely small. To get a cell by chance would require at least one hundred functional proteins to appear simultaneously in one place. That is one hundred simultaneous events each of an independent probability which could hardly be more than 10(-20), giving a maximum combined probability of 10(-2000). Recently, Hoyle and Wickramasinghe in Evolution in Space provided a similar estimate of...'10(40,000) an outrageously small probability...'" pp. 323-24. "The Darwinian claim that all the adaptive design of nature has resulted from a random search, a mechanism unable to find the best solution in a game of checkers, is one of the the most daring claims in the history of science. But it is also one of the least substantiated. No evolutionary biologist has ever produced any quantitive proof that the designs of nature are in fact within the reach of chance. There is not the slightest justification for claiming, as did Richard Dawkins recently: '...Charles Darwin showed how it is possible for blind physical forces to mimic the effects of conscious design, and, by operating as a cumulative filter for chance variations, to lead eventually to organized and adaptive complexity, to mosquitoes and mammoths, to humans and therefore, indirectly, to books and computers.'"p. 324. Denton's work is quite excellent, and I commend it to you for careful study and consideration. If you are a dyed in the wool general theory Darwinist - then read this book in order to broaden the spectrum of your analysis of the subject. As a former atheist and evolutionist, I can assure you that you won't be exposed to any of Denton's important questions within the spectrum of the standard texts on evolution today. If you are a Christian, I would encourage you to read this work, but do remember that ID books are not a defense of biblical creationism - they are secular critiques of Darwinism. But the critique is quite clear - Darwinism is more than a scientific hypothesis, as it was in Darwin's day. Now it has become an organized and mostly unchallenged religion.